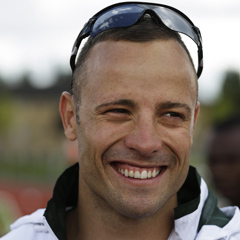 London - South African double-amputee Oscar Pistorius will run in the third leg of the men's 4x400 metres relay heats at the London Olympic Games on Thursday. The sport's governing body the IAAF said last year at the world championships in South Korea that Pistorius, who races wearing carbon fibre prosthetic blades after being born without a fibula in both legs, had to run the first leg, which is run in lanes, because of concerns about the safety of other athletes during relay changeovers. However, in the build-up to the Olympics IAAF President Lamine Diack said it was not his organisation's place to determine the relay order, meaning South Africa could place Pistorius in whichever leg they wished. South Africa will run in the first of two heats which includes medal contenders Trinidad and Tobago and Britain. Nicknamed 'Blade Runner', who finished last in his men's Olympic 400m semi-final, has said that he runs best in the second or third leg and has never had any incidents in previous relay races. Pistorius is the first double-amputee to run in the Games.